But that's against the law in these parts - and so our handsome leading man Sheriff Harkins heads into Blood Bayou with a posse in tow. Soon he will be joined by the mysterious Professor Saunders, his glamorous daughter Charlotte, and a ragtag band of outlaws, scientists, and character actors. Will they close the portal in the final reel, or will they be a light snack for hungry Elder Gods? 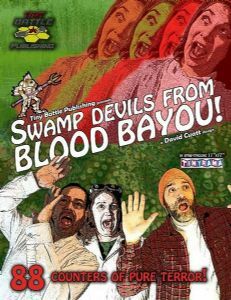 Designer David Cuatt's Swamp Devils From Blood Bayou is a love-letter to a monster movie that never was, with a fast-and-fun chit-pull combat mechanism that will keep you on the edge of your seat. One player controls the desperate humans, and one the Swamp Devils and their dread masters, the Abominations. It's an I-Go-U-Go turn sequence. Many of the human characters, and the Abominations, have special abilities that break the rules in some fashion. There are multiple victory conditions for each side-- do the humans want to perform an arcane ritual to banish the Swamp Devils, or research a more purely scientific solution? Or maybe brute force will do it, by hunting down the Abominations and showing 'em what-for. On the other side of things, the Swamp Devils might want to concentrate on infiltrating the town, or on killing off the humans with top billing.